Yesterday at Chilbolton they made the first incision for the LBA trenches. 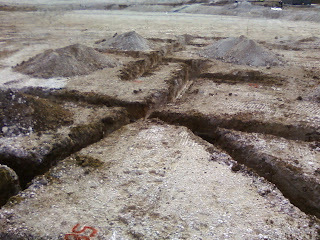 Unlike the HBA trenches which lie on a regular grid, the LBA aerials are scattered across the field in a pseudo-random pattern. This helps ensure good beam properties, but it also makes the cable trenches a bit of a nightmare to dig. However, the ground crew have demonstrated incredible finesse in negotiating the heavy machinery through the labyrinthine trench plan. 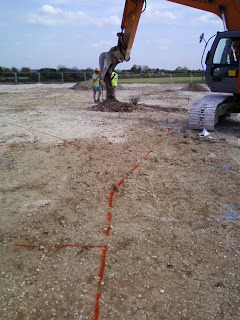 In this picutre you're looking down the line of the first LBA cable trench. It looks like a giant Kanji character scribed into the ground. 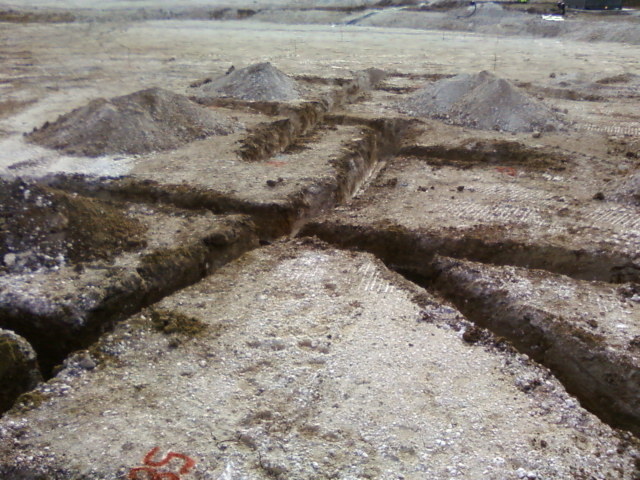 However these are the feeder trenches from the LBA aerials back to the RF-container.